I really can’t remember the first time I ever went to Bahooka but I have always loved it. Sadly the Polynesian/ Tiki restaurant and bar is closing in a couple of weeks. The space and alcohol license was sold but Bahooka maintains its name. This article mentions the possibility of salad dressing under the Bahooka name to be sold at Costco. During my visit on Sunday, our bartender mentioned there were two sales. 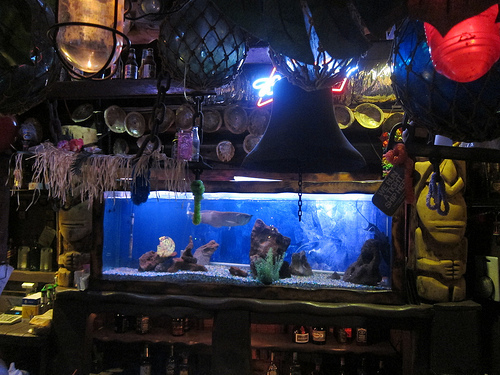 So the beloved kitschy decor and possibly all those fish tanks may have gone to another buyer. I can only hope they mean to display or open their own tiki bar someday. At 6 PM, there were a throng of people and the restaurant said it’d be at least a 2 hour wait. They were severely undestaffed and though they were plenty of tables, they just did not want to seat people. It was probably a good thing. We stood around the tiny bar and marveled. 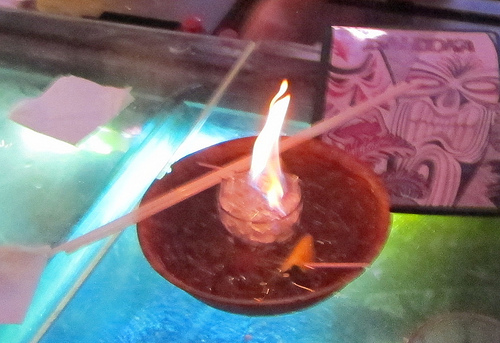 Groups ordered flaming bowls of booze while I cautiously sipped my Planters Punch. 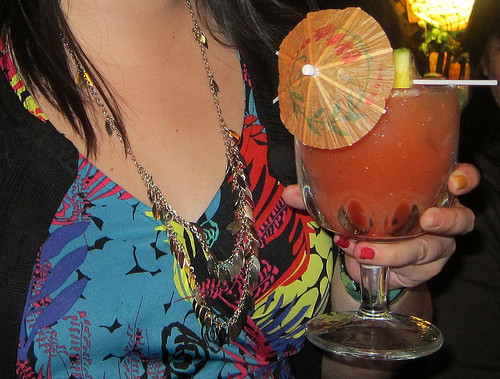 I probably would have gotten my favorite tiki drink, a Mai Tai, but a friend warned it was just very sweet. I lucked out. My Planters Punch was fine, if a little warm. We managed to snag a booth eventually and took it all in. Where would all this STUFF go? 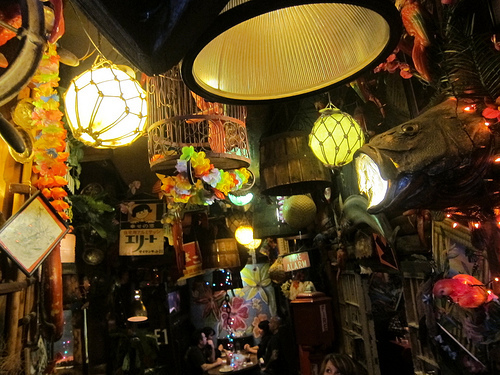 I will miss the crazy decor but I won’t miss the food. Anyone who goes should know it’s for boozin’ rather than snacks. This entry was posted in bar snark, bar stories, bars, cocktails, history, la, la cocktails, los angeles, spirits, the minty, travel and tagged bahooka, bar, restaurant, rosemead, rum, san gabriel valley, sgv, tiki, tiki drinks. Bookmark the permalink.